vi PREFACE. line between these two sides of the language, either with respect to words or to their individual senses. This dictionary, therefore, includes words of dialectal form or provincial use which appear to be an important part of the history of the language. Within the sphere of mere colloquialism, slang, and cant, a much narrower rule of inclusion has, of course, been followed; but colloquialism and even slang must be noticed by the lexicographer who desires to portray the language Colloquialism and natural and full outlines, and these phases of English have therefore been treated with liberality. 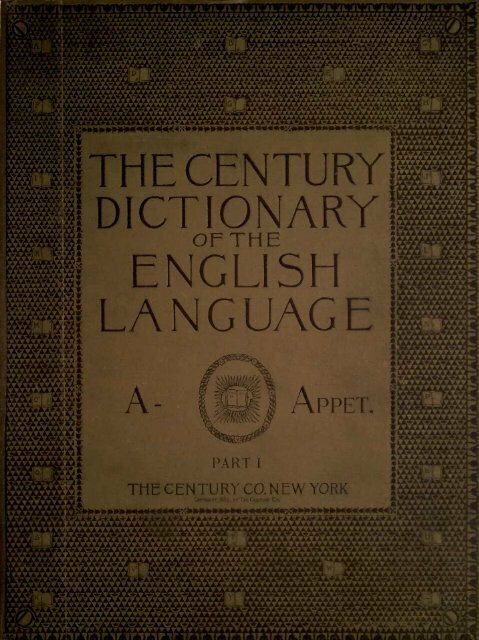 Americanisms, especially, have received the recognition natufally in its to be expected from an American dictionary, many being recorded for the first time ; on the other hand, many words and uses heretofore regarded as peculiar to this country have been found to be survivals of older or provincial English, or to have gained a foothold in broader English use. Another notable increase in the vocabulary is that due to the admission of the many terms which have come into existence during the present century especially during the last twenty years in connection with the advance in all departments of knowledge and labor, scientific, artistic, professional, mechanical, and practical. This increase is nowhere more conspicuous than in the language of the ech ' physical sciences, and of those departments of study, such as archaeology, which are concerned with the life and customs of the past. Not only have English words been coined in astonishing numbers, but many words of foreign origin or form, especially New Latin and French, have been imported for real or imaginary needs. To consign these terms to special glossaries is unduly to restrict the dictionary at the point at which it comes into the closest contact with what is vital and interesting in contemporary thought and life ; it is also practically impossible, for this technical language is, in numberless instances, too closely interwoven with common speech to be dissevered from it. A similar increase is noticeable in the language of the mechanical arts and trades. The progress of invention has brought nearly as great a flood of new words and senses as has the progress of science. To exclude this language of the shop and the market from a general English dictionary is as undesirable as to exclude that of science, and for similar reasons. Both these lines of development have therefore been recorded with great fullness. There is also a considerable number of foreign words Latin, French, and other not in technical use, which have been admitted because they either have become established in English literature or stand for noteworthy things that have no English names. Lastly, the individual words have been supplemented by the insertion of idiomatical phrases that are not fully explained by the definitions of their component parts alone, and have in use the force of single words ; and of the numerous phrase-names used in the arts and sciences. The number of these phrases here defined is very large. No English dictionary, however, can well include every word or every form of a word that has been used by any English writer or speaker. There is a very large number of words and forms discoverable in the literature of all periods of the language, in the various dialects, and in colloquial words that must be excluded. use, which have no practical claim upon the notice of the lexicographer. A large group not meriting inclusion consists of words used only for the nonce by writers of all periods and of all degrees of authority, and especially by recent writers in newspapers and other ephemeral publications ; of words intended by their inventors for wider use in popular or technical speech, but which have not been accepted; and of many special names of things, as of many chemical compounds, of many inventions, of patented commercial articles, and the like. Yet another group is composed of many substantive uses of adjectives, adjective uses of substantives (as of nouns of material), participial adjectives, verbal nouns ending in -ing, abstract nouns ending in -ness, adverbs ending in -ly from adjectives, adjectives ending in -ish, regular compounds, etc., which can be used at will in accordance with the established principles of the language, but which are too obvious, both in meaning and formation, and often too occasional in use, to need separate definition. So also dialectal, provincial, or colloquial words must be excluded, so far as they stand out of vital relation to the main body of the language which it is the object of a general dictionary to explain. The special limitations of the technical and scientific vocabulary will be mentioned later. Page 27 and 28: i annot | -mall -a abacus nent. pi. Page 35 and 36: species. abhor 11 Uha/f., 3. M. W.
amass amass (a-mas'), i'. *. [< F.
. . . anormal cf. abnormal) of LL. antiae antiae (an'ti-e), . pi. [NL.